Having missed the first of the taught lessons, I had a little bit of catching up to do. Ertu went very fast whilst teaching during the lesson so it was very important to pay attention at all times otherwise it was very easy to fall behind. In saying that I was happy with what I had learnt after coming out of the lesson. We learnt how to using the spacing tool (array), the mirror modifier tool and how to extrude and bevel. 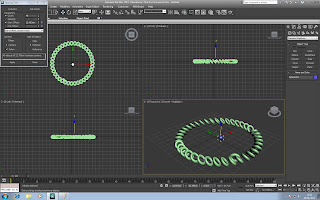 Using the spacing tool- starting off by using the the circle tool then drawing a torus, make sure the torus is selected before selecting spacing tool. Open the spacing tool which is underneath tools> align> spacing tool. Select pick path and click on the circle, the torus should then be grouped around the circle. Really liked this tool as it seems simple, easy and effective to use. It also made me think how this could be used in relation to one of my own designs. If I designed an object on 3ds maxx ( making sure they were linked together) they too could be spaced around a shape.